From ancient masterpieces to some impressive contemporary works of art, mosaics are still quite popular among tourists. The fact that they were assembled using tiny bits of colorful pebbles or tiles makes them even more amusing in our eyes. Below, we picked some of the most beautiful mosaics from around the world. Believe it or not, the famous little house found in the French town Chartres is the work of one man. Raymond Isidore started his work in 1938, and by 1964, he managed to cover his whole house, furniture, floors, and even the garden with colorful pieces of ceramic tiles, broken crockery and more. What is even more interesting is that - though the mosaic looks amazing, often with a nice combination of colors and precise composition - Raymond Isidore was not a professional artist. Nowadays, the impressive work of the man - who worked as a molder, then as a sweeper in a cemetery - is visited by tens of thousands of people in every single year, as the house and the courtyard now operates as a museum. The house became famous in the 1950s, when even Picasso took a visit there in 1954. In these years Isidore was interviewed by writers, and his work lured several photographers too, who took photos of his home - called "La Maison Picassiette". The magnificent 12th-century mosque of the Iranian city Yazd is truly an architectural masterpiece - and the mosaic that decorates its walls are equally remarkable. The dominant blueish colors are accompanied by yellowish, orange and white tiles, and this composition gives a sense of harmony when standing below the precisely built mosaic walls. The building was largely rebuilt in the 1300s, and it's still in use today. Not only the dome, but the minarets and the interior chamber are also covered with mosaics, and so is the entrance, which stands between the country's tallest minarets. One of the best-preserved - and most spectacular - examples of Ancient Roman art is the Villa Romana del Casale, which is a palace located near the town of Piazza Armerina. The remarkable collection of Roman mosaics found on the site is now one of the UNESCO World Heritage Sites. Beside the walls being covered with magnificent artwork, there are parts of the Roman villa where you can see mosaics on the ground and pavement too. The villa was built in the early 4th century AD. Ravenna is famous for its unique 5-6th century mosaics found in the Basilica of Sant'Apollinare Nuovo, the Basilica of San Vitale and the Sant'Apollinare in Classe churches - which are all on the UNESCO World Heritage List. 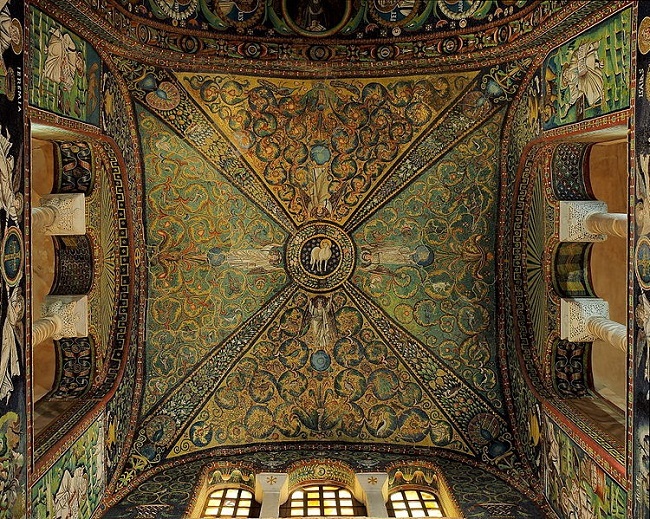 The mosaics - most often telling the story of Jesus - were made when Ravenna was the capital of Byzantine Italy, and the seat of the Western Roman Empire. Beside these three churches, there are some others that still have some splendid mosaics from the 6-7th century, so we can say this city is a "paradise" for mosaic lovers! The Baptistery of Saint John is found in Florance, in the Piazza del Duomo and the Piazza San Giovanni squares. The octagonal basilica was built between 1059 and 1128 in the Florentine Romanesque style, and is one of the oldest buildings in the city. Beside Michelangelo's the Gates of Paradise, this spectacular baptistery is famous for the mosaic that covers its ceiling, depicting angels and scenes of The Last Judgement of Christ. It's really interesting to see a bit of Byzantine influence that is complemented with typical Western iconography. The Shah Mosque was built following the order of Abbas I of Persia, during the Safavid dynasty - between the 16th and the early 17th century. The breath-taking interior was designed by the royal calligrapher and miniaturist Reza Abbasi, who managed to find a harmonious way to merge the lively colors and floral patterns into a sublime and classy piece of art. While there are other remarkable and beautiful buildings in Isfahan, the Shah Mosque is still like a gem among them. The Hagia Sophia, built in 537 AD, is a real gem of Byzantine architecture. Originally, it was a Greek Orthodox Christian patriarchal basilica, but then became an Ottoman imperial mosque, up until today, when it operates as a museum. Not only the impressive structure, and the dome in particular, is world-famous, but the mosaics are also remarkable. Unfortunately, all the mosaics that depicted Jesus, Christians saints, angels and Virgin Mary were covered with plaster, and some of them were even destroyed. Some of the major mosaics found in a 20th-century restoration project are now uncovered.